Ideal for a day in the sun with friends! 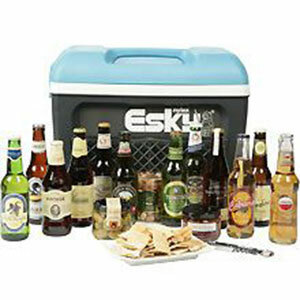 This sensational package of beers, snacks and an Esky is designed for relaxation. The adventurous beer drinker can experience the taste of a different country every night! Included are a selection of beers from Bavaria, China, Italy, The Netherlands and South America (amongst other exotic countries). The beer lover’s choice! Includes a selection of beers from breweries in every state around Australia, including James Boag from Tasmania, Barons Lager from Victoria, Little Creatures Pale Ale from Western Australia, James Squire and Blue Tongue from New South Wales and Coopers from South Australia (beers will vary, subject to availability).